Chris’s 7-year-old daughter pushed him around the hospital in a wheel chair thinking it was fun, but Chris felt weak as he thought about the headache that turned into a nightmare for his family. A few months before he was a busy dad and husband going to watch his twin boys play basketball. Now he was sitting in a wheelchair in the hospital where a doctor had told Chris and his wife that Chris had an aggressive tumor called glioblastoma and 3-6 months to live. He didn’t know in that moment that almost a year later he would have more hope than nightmare. Chris woke up one October morning with a horrible headache even though he never got headaches. “My head was hurting, and it hurt really bad,” says Chris. Chris says, his wife, Tracy, told him to take an aspirin and lay down. The headache didn’t go away and when Chris would get up to go to the bathroom he would walk into door frames. Tracy took him to the emergency room where they did an MRI and found a severe amount of blood in the brain area and it looked like the blood had pushed the brain over. They hurriedly flew Chris to Froedtert hospital where he had an angiogram and he was there for several days. They did not see the tumor at that time because of all the blood on his brain, so they treated him as a stroke patient when he returned to Green Bay for recovery. He tried to go back to life as normal. He continued working and enjoyed visiting clients throughout northeast Wisconsin. 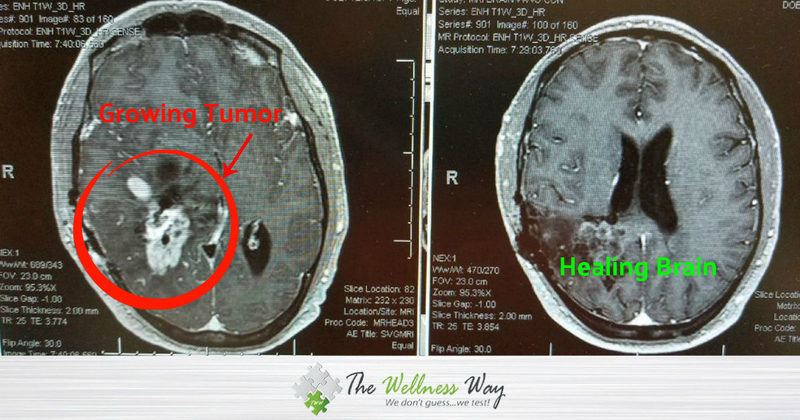 Another MRI in December showed blood on the brain, but they still did not see the tumor. In February, Chris and Tracy were at a basketball game cheering on their twins. Tracy started to notice how cautious Chris was as he stepped on the bleachers and how gingerly he would walk around people. She brought him back to the hospital where another MRI finally showed tumors. When they went to take those tumors out, they found the glioblastoma and it was the size of a baseball. That’s when they told him he had 3-6 months to live. “They are aggressive tumors and the cancerous tumor just wants to grow and obviously take whatever they are in down with them,” says Chris. Chemotherapy and radiation were the next steps. Before they started, the hospital had to make sure all his paperwork was in order for his living will. Luckily, he and his wife had thought of that years ago when the twins were born. They had a family to care for no matter what the glioblastoma wanted. So that meant radiation 5 times a week for six weeks. In June, after all the radiation and chemotherapy were done it was time for another MRI. The results were disappointing and showed the glioblastoma was actually growing. “We knew it was an aggressive tumor, we knew it doesn’t like to go down quick, but we didn’t expect it to be growing after doing all this other stuff,” says Chris. While the doctors changed their course with another drug called Avastin, Chris was tired of all the side effects. He was worn out quickly, took naps and couldn’t mow his lawn. Chris used to be in pharmaceutical sales, so he knew drugs came with a lot of side effects, but he also knew there was an alternative approach. Tracy had met someone who worked at The Wellness Way. Chris and Tracy learned more about The Wellness Way Approach to health, building immunity and allowing the body to do what it was meant to do. During Chris’s first appointment at The Wellness Way, they talked about nutrition and the benefits of IV’s. Chris went home with a list of supplements and a plan to eat better. That meant cutting out breads, processed foods and Mountain Dew. He had his first IV on July 5 and changed his eating and drinking habits. Chris went back for another MRI in December. It’s still shrinking and it’s barely noticeable on the MRI. He is hoping for even better news for his next MRI. “So, we are very optimistic, and we have to be in this journey,” says Chris. Chris says now he can finish his bucket list. He’s going to get a juicer and try sky diving. “I’ve already pushed some limits of what the body should go through and shouldn’t go through,” says Chris. The Wellness Way Clinics across the United States have a different approach to supporting the body that takes a personalized approach to healing. Boosting the immune system, boosting oxidative properties and eliminating free radicals works for many people but it is important to do tests to see how your body will respond. “I know that this solution or concept is not well known by a lot of people and I think partially it may be being hid behind the rafters just, so a lot of people won’t know about it. And that’s too bad,” says Chris. Chris says, he hasn’t felt and looked this great since college. He has pipes and has gotten leaner. “I think my wife is going to start chasing me around,” he smiles. He has found a new hope and new way of living. He says he’s going to keep eating healthy and his healthy habits have extended to his family and friends. They are amazed by how great he is doing. “The outcomes are good and I’m seeing the results because of it,” says Chris. Thank you for your comment and we understand how important health is. You know that very well and how scary it can be when health is at stake. One of our doctors is contacting you personally to discuss any questions you may have. Thank you! Your e-mail didn’t work can you give us a call at 920-429-2844 and one of our doctors will contact you personally.